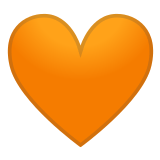 🧡 Orange Heart Emoji is an intermediate variant between the red heart of love and the yellow heart of friendship. Orange color is most associated with warmth, care and sunshine. This emoji does not contain any strong romantic overtones or flirting, so you can safely send this heart to indicate your openness, support, or friendly intentions. 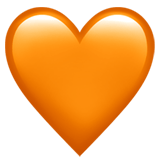 Orange Heart Emoji was approved as part of Unicode 10.0 standard in 2017 with a U+1F9E1 codepoint, and currently is listed in 😀 Smileys & Emotion category. Use symbol 🧡 to copy and paste Orange Heart Emoji or &#129505; code for HTML. This emoji is not so new, but some old devices can't display it properly. You can get similar and related emoji at the bottom of this page.